Behavior is a human aspect. It is an attribute that needs constant guidance to get improved. Parents and teachers needs to be very vigilant about this aspect. It is their duty to see that the character and the behavior of the child or the student get shaped in the right direction. For this purpose that the behavior plan templates can be used to bring improvement in the characters of the children and to bring them up in an upright manner. Available for download online for free or as premium templates, these high quality plan templates can let you fill out separate fields for your ward’s identity, goals and target behaviors, behavioural functions and deficiencies, desired replacement behaviors, strategies for intervention, responsible parties etc, long term behavorial and life goals, as well as letting you create planned and detailed timelines by which to progress and exhaustive progress reports in order to monitor changes. Thus these templates can be handy reference guides alongside helping you create your strategy. 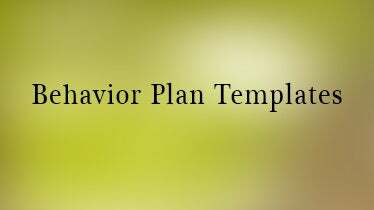 These templates can be used for the purpose of creating a plan structure that will be useful for the purpose of bringing up improvements in the nature and the behavior of the child. The structure of the format is very simple and yet effective. The designer has kept no frills that make the template all the more suitable for children. The design of this layout supports the information of the name of the subject, whether it is a child or adult. In this template, you have a table that can have information of various events that have been organized to change the behavior of the subject, the results of the same and the follow up work. The template is fully editable. 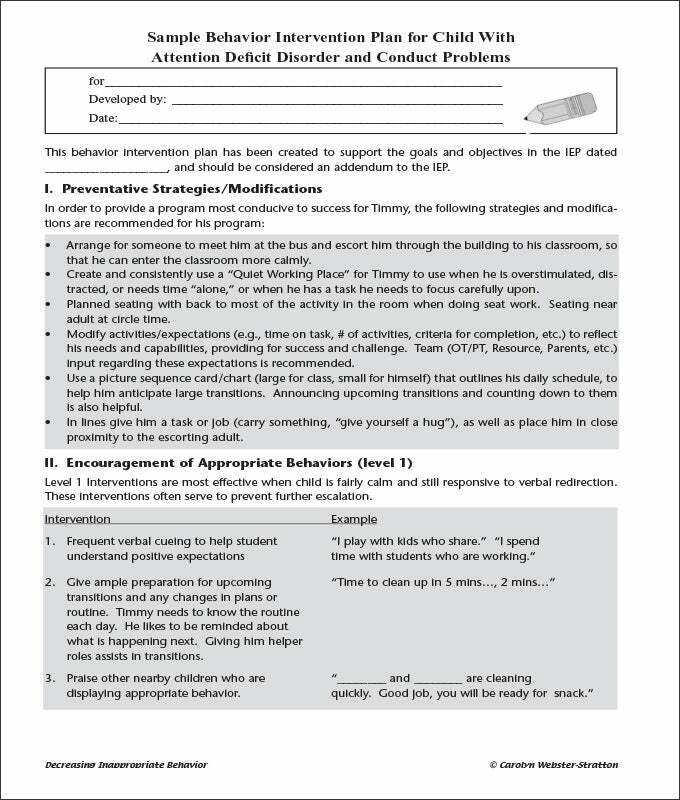 The design of this behavior plan template is rather unique as it provides a structure that supports information pertaining to the frame of a plan. It supports the change and improvement in the behavior of the subject. These templates are fully editable and changes can be made with ease and fast enough. 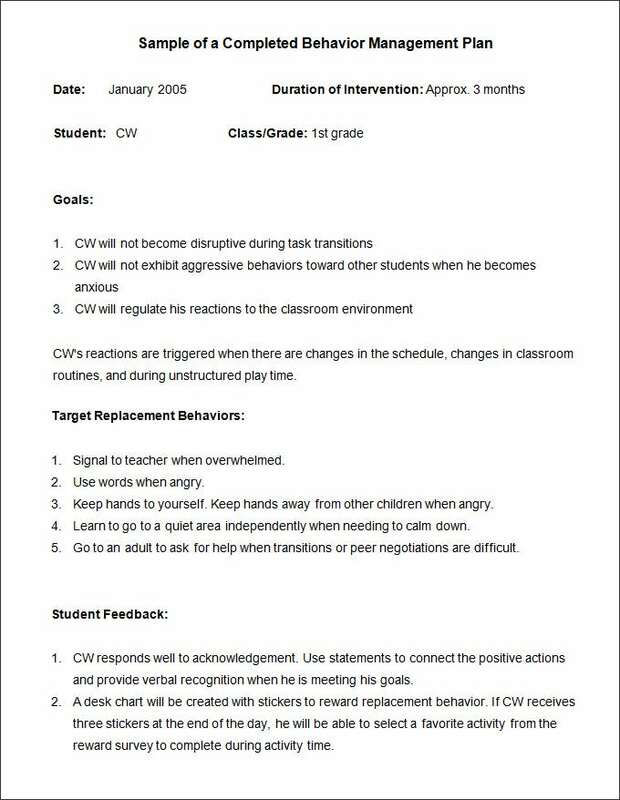 What is a Behavior Plan Template? This is a structural format that can be used by either a teacher or a parent or even a doctor to make a plan that will help to bring about a structural and a developmental change for the children. This is a format that will reduce the work of a parent or a teacher and will help him or her to plan the job in hand. 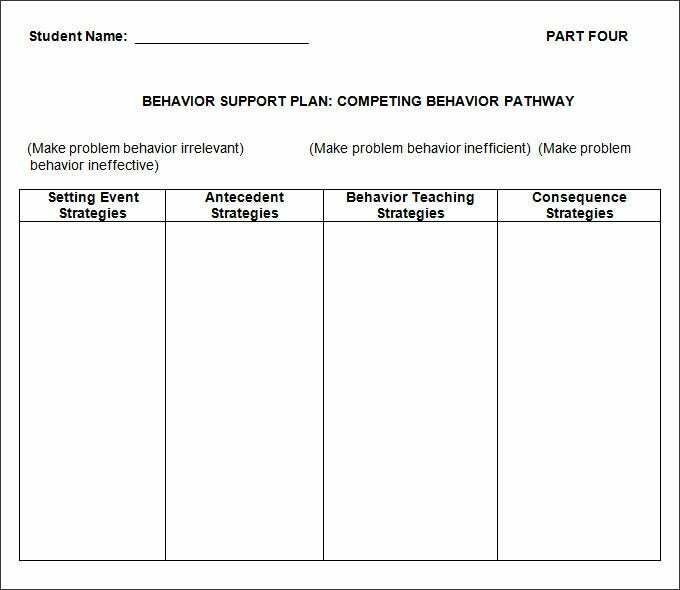 How to Create a Behavior Plan Template? The plan for behavioral change for your child is needs to be simplistic. Note that that we cannot change too many things in the behavior of the child at the same time as the chill may not be able to handle it well. Hence the format has to be such that it will attempt only one or two basic changes in the behavior of a child within a stipulated time. This is one of the best tools that help a parent or the teacher to plan the job on hand and give a dateline for a job. The templates give a comprehensive planning and also can be a great help while you do improvement evaluations later. The guidelines and motto set in these templates ensures that the behavioral planning management is done efficiently. So use these behavior plan templates and let your child have a well-organized development plan, which you can closely monitor and plan further improvement based on the results visible. If you have any DMCA issues on this post, please contact us!